Historical Helmets. Perhaps no piece of armour underwent as many changes from Rome to the Renaissance, as the helmet. The helmet or helm was developed to keep up with advances in weaponry of the times. Our store offers a huge variety of historical helmets for you to choose. Our helmet section has early Roman Helmets and Greek helmets. Including Centurion Helmets, Roman Trooper Helmets and Gladiator helms. The Viking and Norman helmet section contains Spangenhelm type helmets, which were usually worn over a mail hood or with an attached mail aventail (neck guard). These type of medieval helmets often had a front nasal, cheek guard and the Viking helmets sometimes had spectacles. The Medieval Helmet probably went through the most changes of any type of historical helmet. Early Medieval Helmets were an upgraded form of the Norman Helmet in which they started adding a full fixed visor to replace the nasal. These medieval helms, especially the Crusader Helmet, began to flatten out on top and the sides and backs extended to form the Great Helm or barrel helmet. The top of the great helm became rounder to protect from sword blows and became the Bascinet helmet. Visors became movable and went from the flat Klappvisier to the elongated pig face bascinet of the 14th century. During the 15th century we saw helmets such as the open-faced sallet helm, the T Face Barbuta, and the Sallet helm. The medieval Sallet Helm came in a variety of fixed and movable visors with fixed or articulated tails. The final form of the medieval helmet was the armet which developed into the early Renaissance Close helm. These helmets became known as the typical Knights Helmet. During the Renaissance, weapons advanced more rapidly and as the sword became obsolete, visors faded away for better vision, such as the Comb Morion helmet and open faced Burgonet Helmets. During the later periods, the helmet became more of a symbolic head dress than protective gear. With the onset of the world wars, the helmet once more found its way onto the battlefield and took on the shapes of the earlier medieval sallet helms. All the historical helmets in this section (with exception of the decorative helmets) can be worn, and many are functional battle ready helmets. Many of our helmets can be made to your measurements and steel thickness needs, to meet your re-enactment group requirements. As with our other armour, these helmets can be used for display with the addition of one of our wooden helmet stands. Our Polyurethane Armor Helmets are made by traditional armorers, manufacturing Museum Quality helmets in hybrid polyurethane. Hybrid Helms will not rust, dent or corrode. Helms are only around 3 pounds each, how about that for comfort! Roman Helmets and Greek helmets. Including Greek Helmets, Centurion Helmets, Roman Trooper Helmets and Gladiator helms. Greek and Roman Plumes and Plume Holders. Viking and Norman helmet section with Spangenhelm type helmets, worn over mail hood or with attached mail aventail (neck guard). These medieval helmets often had a nasal, cheek guard and the Viking helmets sometimes had spectacles. We offer fully functional, wearable and many custom made Medieval Helmets. 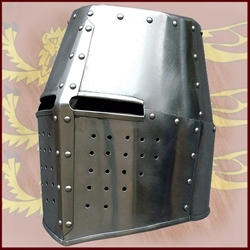 Medieval Great Helms, Crusader Helmets, Knights Helmets, Sallet Helmets, Jousting Helmets and more! We offer functional, wearable and many fully custom designed 16th Century and Renaissance Helmets. Close Helms, Burgonets, Comb Morions, Knight’s Helmets, Pikemen’s Pots, Lobster Tailed Helmets and more! Modern Era Helmets from the 19th to 20th centuries, contains functional and wearable modern helmets for collectors and re-enactors. Officers Helmets, Firemen’s Helmets, WWI helmets, Pickelhaube helmets and US M1 Helmets from WWII. Japanese helmets (Kabuto) and face guards (Mempo) are superbly constructed, beautifully detailed and great value! Replica Japanese Samurai Helmets, Takeda Shingen, Oda Nobunaga and Date Masamune. Japanese helmets are Wearable. Our fantasy helmets offer the same great quality as all our historical helmets. From display armor to custom pieces, our fantasy helmets are wearable, functional or battle ready just like our historic helmets. Full line of Miniature Helmets. Our mini helms are miniature replicas of our full size historic helmets. Miniature helmets make perfect gifts for history buffs and collectors. Great for home or office, especially if you don’t have room for a larger Medieval or Roman helmet. Helmet Stands For Properly Displaying Your Historic Roman, Celtic, Medieval and even WWII Helmets. The stands will Handsomely accommodate any size helmet from Comb Morians to Great Helms to Military Helmets. Our Decorative Helmets are unique decorative pieces of armour, many made in Spain. Each historical helmet is meticulously handcrafted using materials similar to the original historical pieces.